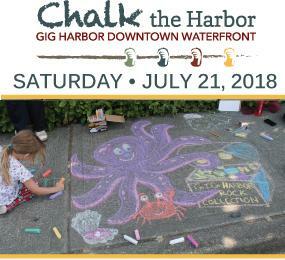 On Saturday, July 21st, children, families and adults are invited to decorate the sidewalks of the downtown waterfront. The Downtown Waterfront Alliance provides free chalk along with Certificates of Award in the following categories: Kids, Family, High School, College Students, Adult, Group and Best Maritime-Nautical art. Participants are encouraged to bring a chair or knee pads. A maritime theme is encouraged, though not required. Look for face painting and Harbor WildWatch touch tanks at Skansie Brothers Park. Chalk the Harbor is sponsored by Peninsula Light Company.